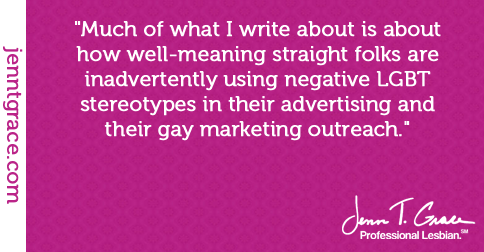 Are you non-verbally stereotyping in your gay marketing? Is your LGBT marketing non-verbally stereotyping? 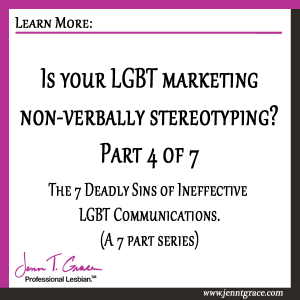 Home » Business » Is your LGBT marketing non-verbally stereotyping? 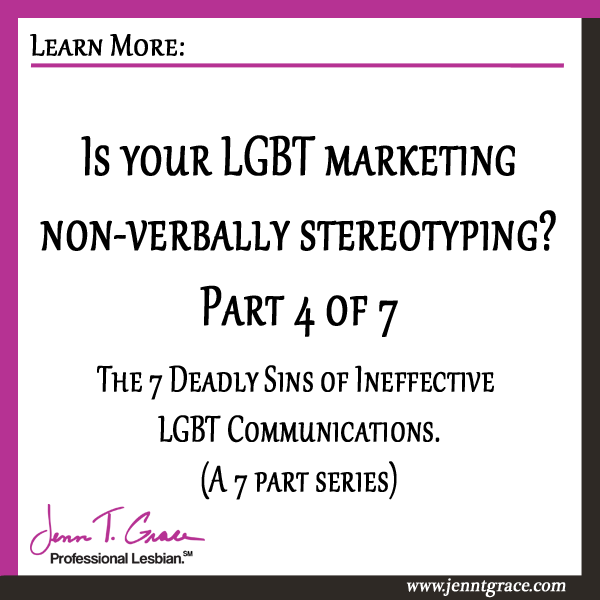 Welcome to part 4 of 7 of the “The 7 Deadly Sins of Ineffective LGBT Communications.” This entire series is based around the idea that I believe 98% of miscommunication blunders occur for one of 7 reasons, which I’ve dubbed the 7 deadly sins. We’ve already covered 1. Assumptions 2. Stereotypes and 3. Inappropriate Questions. In this post we are going to talk about Mannerisms which will cover all things related to non-verbal cues. You can also check out the remaining posts in this 7 part series which include – 5. Insinuations 6. Implications and 7. Assertions. This post took a good amount of research on my end to make sure I am articulating these common pitfalls in a constructive way. It’s very easy to tread down a slippery slope when talking about the myriad of stereotypes inflicted on the LGBT community. So while looking for data I found this statement on another blog “The flaming homosexual people are called camp, they are the stereotype of homosexual people, but I can assure you that almost all homosexual people never act that way. Don’t listen to the loud minority.” (Remember using the word homosexual in your marketing is a deal breaker – read more here.) While I don’t agree with how that statement is worded or recall its full context, I found the concept of the ‘loud minority’ particularly interesting. 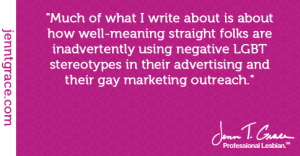 Much of what I write about is about how well-meaning straight folks are inadvertently using negative LGBT stereotypes in their advertising and their gay marketing outreach. So when I saw the term ‘loud minority’ it struck a chord with me. We know that all stereotypes are based on something. Often an entire community of people is misrepresented by the minority of the community, dubbing it the loud minority seems absolutely appropriate. (This is applicable for communities other than the LGBT community as well.) I have a good way to illustrate this for those of you who may be fans of Survivor on CBS. On the Survivor Blood v. Water season, they brought in two people from a family and then put them on separate tribes so they were essentially competing against one another. While I am not a big fan of the show, my wife is, therefore I’m subjected to watching it. 😉 They featured a gay couple, Colton and Caleb. I bring up this couple to show how drastically different two gay men can be. If you saw the season you will know what I mean. But if you didn’t the key takeaway I want for you is the LGBT community is not a monolith. The LGBT community is as diverse as any other. 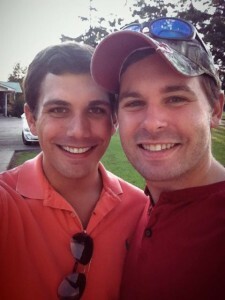 Just because two men are gay does not mean they have anything in common. Just as two straight men side by side may have nothing in common other than their gender. The same is true for lesbians and women in general. Now as I’ve already stated but it’s worth repeating, stereotypes come from somewhere. For every group of people who are stereotyped, they are done so by the loud minority of people. This does not mean that this is representative of the entire LGBT community and because of that you should not rely on these things for your LGBT/ gay marketing efforts. Just like any other stereotype it will only get you in trouble! Here are a handful of other non-verbal stereotypes that will only get you in trouble if you attempt to perpetuate them in your LGBT/ gay marketing. The commonality here is that these are all non-verbal cues. In any LGBT/ gay marketing effort you need to be conscious of not just the language you are using but also the messages you are sending non-verbally. In all of your marketing you need to be sensitive to the community you are trying to reach LGBT or otherwise. It is no different if you were trying to target moms and your advertising only portrayed middle to upper class stay-at-home moms. While there is nothing wrong with that demographic of moms, it is by no means representative of the myriad of other types of moms out there. Pigeonholing your marketing in that way would be a detriment, unless that was your specific intention from the outset. Can you think of other non-verbal stereotypes that I didn’t mention here? If yes, leave a comment below! There is a great chance I will use your comment in a future blog post. And remember to read the next part in the series where I discuss Insinuations. Shorten your learning curve and get the book, The 7 Mistakes Preventing You From Selling to the $830 Billion LGBT Market, today! 3 Responses to Is your LGBT marketing non-verbally stereotyping?